May 9, 2011 - On Saturday a Merpati Nusantara Airlines Flight 8968 on a domestic flight from Sorong, West Papua, Indonesia, to Kaimana, West Papua, Indonesia crashed killing all 21 passengers and a flight crew of 6. The Xian MA60 aircraft crashed off the coast of West Papua on approach to Kaimana Airport in heavy rain. The Chinese made turboprop Xian MA60 aircraft was manufactured by China Aviation Industry Corporation I with a registration PK-MZK had entered service in October 2010, and had flown for a total of 615 hours at the time of the crash. Reports indicate that Flight was on its final approach, after holding for fifteen minutes, to the Kaimana Airport at about 1400 local time (0500 UTC) when it crashed into the water about 1,600 feet from the runway. Weather conditions at the time were rain and fog with visibility under a mile under dark skies. Indonesia officials report the aircraft slammed into the water breaking up into two pieces and sank to a depth of 100 feet. There were 27 people on board the aircraft, of which 21 were passengers, four were crew, and two were unspecified technicians. Rescue teams located 15 bodies floating on the water and the remaining passengers were trapped inside the wreckage. 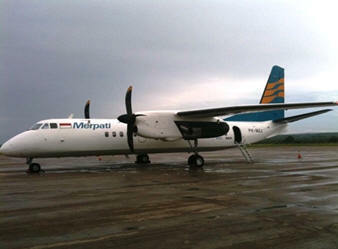 Merpati Nusantara Airlines is an airline based in Jakarta, Indonesia. It is a major domestic airline operating scheduled services to more than 25 destinations in Indonesia, as well as scheduled international services to East Timor and Malaysia. Its main base is Soekarno-Hatta International Airport, Jakarta. The word merpati is Indonesian for "dove", and Nusantara is a geographic term referring to parts of Indonesia. Indonesia's safety record has been in the spotlight recently after a series of accidents, in 2007 the European Commission banned all of Indonesia's airlines including the national carrier Garuda in the European Union. However, as of April 2011 Indonesia carriers are allowed back into the EU with the exception of six passenger carriers, Merpati Nusantara Airlines remains on it.